This edition of CTR features the contributions of six scholars. Of these, three deal specifically with issues related to the General Epistles. In the lead article, “The Authorship of Hebrews,” David Allen, Dean of the School of Theology, Southwestern Baptist Theological Seminary (Fort Worth, TX) makes a survey of historical literature that supports his position that Luke was responsible for penning Hebrews. With an abundance of evidence, Allen presents a compelling case for his position. Respected NT scholar Peter H. Davids, Professor of NT at St. Stephen’s University (Saint Stephen, NB), examines the “larger theology” of the Epistle of James. Breaking new ground, he shows that James has much to say about God and the human situation in the context of the Roman Empire. 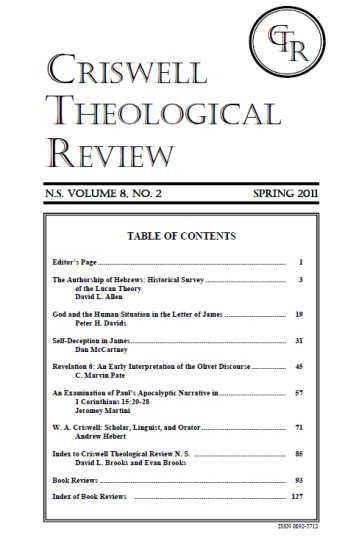 Switching gears a bit we turn to C. Marvin Pate, Chair of the department of Christian Theology at Ouachita Baptist University (Arkadelphia, AR), who offers the article “Revelation 6: An Early Interpretation of the Olivet Discourse,” which deals with the seal judgments. Pate argues that Revelation 6 dually pictures the fall of Jerusalem (AD 70) and the future fall of Rome at the Parousia. Narrative in 1 Corinthians 15:20-28” takes a look at the cosmic power of Deaeth, which holds humankind under its sway. After carefully exegeting the passage and interacting with other scholars, Martini concludes that only at “the end” (to telos), will believers be released from its grip. Our last entry is an index of every article published in the CTR, New Series, since 2003. A special “thank you” to David Brooks, Professor of OT at Criswell College (Dallas, TX) and to his son Evan Brooks for compiling this helpful research tool. We conclude this edition of CTR with 34 pages of book reviews, which are offered to help you in selecting books for the classroom or your personal library.